Frank Alpizar is a fascinating young man. A Cuban tour guide, born and raised in Havana, and a product of the Cuban Revolution. Not many are fortunate enough to be awarded the opportunity to leave Cuba and visit the United States as a tourist. I was able to spend some time with Frank during his 30-day stay in the states, and he was kind enough to speak very candidly on his thoughts of the Cuban Revolution, his experience in the United States and what he thinks the future holds for Cuba. What were your misconceptions of the United States? What did you think? What did you expect and what was a lot different? Okay, we were always told that it was going to be more dangerous. That the US was a dangerous place. You shouldn't go there because you could get killed. Something like that. And it was dirty and polluted. We were told. It's true, we were told exactly that. I'm telling you. That's really interesting. By school? Were you also told that by your parents? No, mainly by the school. Mainly by TV. Wow… Okay, so I don't know if you want to answer this question. You don't have to answer anything you don't want to. You've kind of grown up as a product of the Revolution. Do you think it was good or bad… do you think it accomplished anything for your country? Like I always say, the idea of the revolution was great. It was amazing. Bringing freedom for the people. Freeing our people from a dictatorship. There was a terrible dictatorship. Batista killed over ten thousand people, and revolutions are always radical. That's why they're called revolution. They're radical. They will tear down something. They will destroy a concept and, inaugurate another concept, and they will create ways of life that are different to the previous ways. And my revolution, what it did was simply bring social welfare to the people. Build them more schools, build them more houses, build them more hospitals. They constantly tell you what it was before the revolution in ’59 and what it is now. For example, that they built many aqueducts. They improved the infrastructure of the country, built roads, built hospitals, schools. Many times they used big mansions to turn them into schools, day-care centers, hospitals, clinics. They made it effective that people could have free access to health-care. Education at all levels, like, people go to university and don't pay, don't have loans. That's a good thing about it. The revolution has done that. Can you describe the process of coming to the United States? How did it all happen and how difficult was it to make it happen? (jokingly) Can you edit that? I know, right. Can you do it in a couple of sentences? It is very difficult for a Cuban person to come to the US. Very difficult. They have, I think close to half a million applicants. Maybe I'm wrong about this, but they always say they have a bunch of applicants and only a very small percentage of people are accepted. They have a plan, which they agree with Clinton's administration in the 1990s, I think in 1994 or 1995, to give Cuban people 20,000 visas to come to America. And then that plan is happening. Every year, your government gives 20,000 visas that can be forever, for good, or just as visitors, humanitarian or as tourism in general. So you had to be invited by someone, correct? You got to be... somebody has to sponsor you to come here. That happens not only to the US but to every single country in the world. When they invite Cubans, you need to have a sponsor and, not to every single country, now we have a few countries that don't need a sponsor, but the majority of the rich countries, I would think all of them, you need a sponsor that will take care of you in case you stay. What about the process of going to the US consulate? It is a little bit, like I was saying... its simpler now, but when I went there, it was very very difficult. Cause you had to go through different stages. They will give you a turn, then you got to update it, then you got to call again, like, my family here did it all, and my friends also did it all here, to like bring my turn earlier and I actually didn't have to wait much. Most of the people, when it is life parole, when they stay, you know, to live in the US, they got to wait like three, four years to get their turn to go to an interview. I just waited for like five months. Because you were just visiting? Because I'm just here for tourism. Now I think the wait time, the average wait time is around three months, because people move into shifts or turns. What was the hardest question you were asked in your interview? What were my links to Cuba. You know, it was very hard to explain since he asked me, “are you married?” “No”. “Do you have children?”, “No”. “So what are your links to Cuba?” And I said, “my family, my work, my property, my country,” that's what I said. How has the new relationship with America affected your life back home? Well I don't think its got like an immediate effect on my life personally, but I'm sure its got something to do with um, probably the way of life of the people. Now people think different toward the United States and now the government doesn't really have an excuse to say, you know, we have an enemy. So our life is better since we now can speak up and, sure, we can definitely say a couple of things that we don't like. And of course with my job, its been even better because I know I'm going to have many more clients from the US. What do you want most Americans who have never been to Cuba to understand about your country or your culture? I would tell my friends in the US, or the people who are willing to travel, that when they going to go to Cuba, they need an open mind. Its a very very different country. They say, “oh no I've been to Latin America, I can go to Cuba”. Its very very different. Just picture a country with no credit card, no credit whatsoever. No debit, no banking industry, no stock exchange. Just picture that to give you an analysis of the economy, where everything, or most of the property is owned by the government. Very limited amount of properties are owned by the people, mainly their homes and a couple of now private businesses, they're growing by the minute. What is one place most tourists don't see in Cuba but you think that they should? Most tourists don't see the southern part of Havana because they think, they only go to the airport, they barely go there. And also there are beaches near Havana where tourists barely go because they consider it to be very Cuban, but they should go there. They should go to the beaches, both on the east and west part of the city, because they normally go to the islands, and they're nice but they're very touristy. You should go to the beaches where Cubans go. You had mentioned earlier that Cuba has allowed WiFi in the past few weeks, which it didn't have when I was there in February. What is it like for the people that have never had access to the internet before? There have been ways around it, but what about the people that have never even used it and all of a sudden have it available? Everything that is new, you got to get used to. For me its got to be very difficult because I was here. Just had my first Instagram crap and, yeah its going to be new. I wasn't actually there when it all started. I was here. I was here in America when everything started so I don't really know how it is going to happen. I introduced you to Instagram yesterday. How do you feel about it.? Its a little bit overwhelming for a Cuban, because there are many ways to connect there and its like a huge network with no limits. And we have been taught that there are limits in life and when you get to a country like this one, you realize there are none. Not a single limit to life. Life is limitless. That's the way it should be. Now that you have come to the United States, what do you think of it here? I use the phrase… I called America a rough paradise. Its a beautiful place. Its very clean but its too tough for a Cuban. Its a little bit difficult for a Cuban. That's the way I see it. What did you think when I told you that most Americans don't have more than two weeks off a year, and when I explained how bad the economy had been since, since 2008. Were you shocked? Well, one of the things I had been thinking is that we were so isolated from the world. Unfortunately thanks to you. Your government, not you guys. Uh, but sure. One of the bad things about Cuba is that we are so distant to, from the rest of the world but at the same time we're safe from crisis or crashes cause we're always in a constant crisis, so we don't really realize when it goes down or goes up. We don't really know. So it feels really horrible to see that your lives are ruled by a major economy and if it crashes, you crash with it. Its very very difficult. And that you get almost no days off? Don't take that to Cuba, please, don't take that. You guys will have to stay tight with the Italians or something for days off. We enjoy our time off enormously. We have lots of hours that will help us realize that we have a life and not the life of others. Its difficult for people to understand, that live here, that most other countries work to live. And we seem to live to work. Yeah, that's one of the shocking things about this culture. Its like Americans are born and as soon as they're born, you can ask any American little kid what they want to do and they just want to work. Its weird. Nobody wants to travel. Nobody wants to enjoy anymore, and I think you should take your time off and think of life. Its great. Its amazing but the variety, its great because Cuban food is a little bit monotonous at times. The variety is great, its great to change but I miss my Cuban food. Not really El Aljibe, but only what El Aljibe represents. Like chicken, rice and beans. Salad. Our salad is different. In N Out is great. Its amazing. The best burgers. We talked about this a little bit yesterday, but you mentioned that any Cubans you know that have come to the United States have stayed and never gone back to Cuba. I know that you're not staying and you told me that you're the only person you know that has come here and is actually going back. So could you explain to me why you're going back to Cuba? What's keeping you there? Well I said that the majority of the people I know have been here or have made it to America have stayed and have created a new life here. I'm not going to stay here because I have a life. Most of these people were not comfortable with their lives. And they were like, “you know if I go to the US I'm going to have a better life. I'm going to have freedom” as they call it. I have freedom in Cuba. I feel very free in my country. I do whatever I want. I travel. But, sure my life is pretty easy. Compared to a lot of the people that are leaving? Compared to.... Exactly. I talked to my family here and they have so much trouble to survive here. I don't know. As a tour-guide, you're very well off by Cubans standards, right? That's what they say, yes. How does your life differ from most Cubans? What things do you have access to that others don't? Well tour guides work much more time than the rest of the people in Cuba. We work much longer because we don't have really a schedule. We don't have a plan. We just go with the flow. If the season starts in November, we start in November. The season starts in August, we start in August. If they ask you to work all the way to 1 AM, you got to do it. Its like, I don't know, I don't know how to compare that here in America probably to other tour-guides here. I don't know. But you know, in America probably you can program your life easier than in Cuba, if you're a tour-guide. If you are just a regular office worker in Cuba, you know you have a schedule. You begin at eight, you finish at five, weekends off. And in Cuba, and if you were a tour-guide, its not like that. You know, you have a couple of months where you don't exist. You're part of something. A very well oiled machinery that will bring you into, like, for example the winter in Cuba like a new year. What you celebrate here on New year, New Year's Eve, or Christmas or Thanksgiving, or whatever that comes into what we call the winter in Cuba, for me doesn't exist. I don't recall celebrating New Years Eve with my mom in the last five years. I'm always working that day because I always have plans that day. Benefits that I have that others don't? You have a very coveted job in Cuba. Since we work on those dates and since we work with no schedule, we have access to hard currency because of tips, and we can multiply, many times, the average salary of a Cuban, by, only by earning tips. And that's a good thing. I have access to hard currency, and with that I can make my life a little bit easier, slightly easier than the rest of the people. But there are people who have way more money, make way more money than what I make in Cuba, just doing nothing. 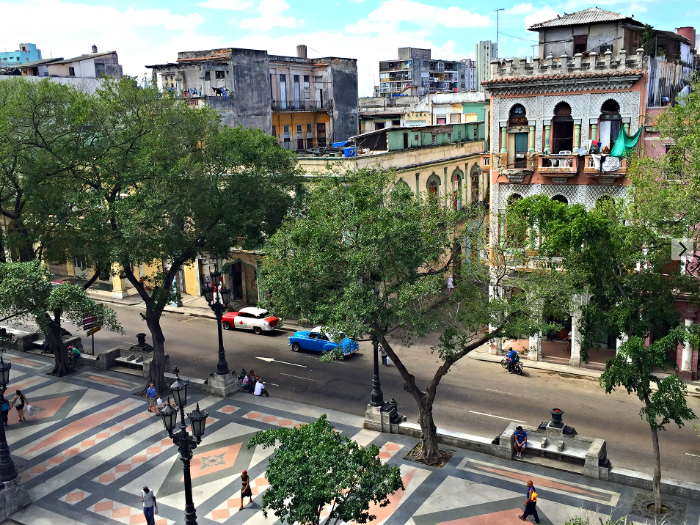 Is Havana ready for the influx in tourism from the Americans? Havana is not ready at all, the way I see it, structurally, for a big bunch of American tourists and its not ready not only from a structural viewpoint, but also from the minds of the people. We're not ready to please everybody, but we are very welcoming people and we are easy to get adapted to many things. And we have received many more tourists than the ones we have expected before. A friend of mine asked me once if I want to see cruise ships, American cruise ships in Cuba. I said yes. I want to see them because they're going to make our lives way easier. People can stay in the boats and walk around the city. Buy, buy, buy, shop, shop, shop and bring money to our people. Eat if they can, and enjoy if they can. I want them to enjoy. What do you think the future looks like for Cuba in the coming years? How fast do you think change will come or how slow? Well the future looks a little bit appealing to me. I want to see it, like, that's why I'm staying in Havana, my city. I want to see it happening. I've endured Cuba for 31 years so I don't want to miss it in the best part. Its like, skipping a film at the end, you know, because you're in a rush to pee. Uh, you know, probably you feel the urge, but you don't, you cannot do it now, you cannot betray your country. What has the most exciting part of your trip been so far? Besides In N Out. Exciting part of my trip? The moment I landed in Miami. It was for me the most exciting part of my trip, because I, probably when I was seeing Havana from the distance on the plane, it all started to come to my mind, like, “what the hell is happening, you know, what am I doing? Am I really going there?” I felt sometimes when I told people in Cuba, something you never do. You never tell people in Cuba that you're traveling. In America you announce it. You cannot tell everyone that you're doing it because you will probably have a fear that somebody will, like give you, uh, evil eye, but in Cuba, evil eye and jinxing is part of life, so you never talk to people about your plans. And I told everybody that was coming here. I kind of felt like, I don't know, the plane was going to fall or something. That something was going to happen and nothing happened so far. Wow. Can you explain how you felt when we walked into the store with all the sports hats and jerseys yesterday? You were really overwhelmed. Tell me, what was going through your head? Sure, the store. The Cuban people are very cut from real life. Like, we don't have access to many of the things that you take for granted in the US. One of these things is, we love sports. We like sports enormously. In Cuba, there are people who follow the major leagues, NBA, maybe not so much the NFL, but sure NBA, major leagues, and the other soccer, soccer leagues in the world, we follow that but we cannot have sports memorabilia all the time. At least not updated. And, historical jerseys of the LA Lakers, which were my team forever. Seeing them there, seeing Kobe Bryant's shirt, seeing, Wilt Chamberlain shirt there. I felt a little bit, you know, a little bit sad, not being able to enjoy that when I most wanted it. That was, yeah, that was why I felt like that. And I wanted my people to have it just like the way I was enjoying it. Last question, will you come back to the states? Of course. I need to come back to United States. For me I believe it is probably one of the best places for tourists, uh, because the whole infrastructure is created to accept many more tourists. I encourage my fellow Cubans and Americans to travel within the US, because it is a beautiful country. Its got so much to offer, and of course I will come back, I need to see the East coast. You do, you need to see New York. Is there anything else that I didn't ask that you want to say? Anything you want people to know? I will probably encourage American tourists coming to Cuba, that as long as your credit cards don't work in Cuba, bring a lot of cash, because Cuba is a cash economy, and you got to beware, when you pay for everything, your plane tickets, your accommodation, whatever, bring some extra cash because you are going to need it. I think that I suggested to my readers that whatever you think you should bring, you should double it and then multiply it by 3, because I doubled what I thought I was going to need and I was out of cash by the time I got to the airport, I had nothing left. That's something that you need to tell them. Credits cards are accepted, most of the places in Havana are going to tell you that they don't have communication with the credit card company because they love cash. And whenever they can make some extra little thing, they will try to make it at least twenty cents, so they will normally tell you that the cash, is preferred in the country. So bring cash. Its okay, nobody is going to steal from you, Cuba is very safe. Keep that in mind that Cuba is a very safe country. Tutto Bene.